Photo 01: Heinkel He 111s of 4./KG 26 bask in the sun at Aalborg in 1941. Note the matt black washable paint applied crudely to the undersides, aircraft codes and national markings for night operations. KAMPFGESCHWADER (KG) 26, known as Löwengeschwader — the Lion Wing — is one of the most famous Luftwaffe units of the Second World War. What is much less well known, however, is that this distinguished bomber and anti-shipping unit, which fought on all fronts of the European theatre during the conflict, lost an entire Staffel (squadron) during the early days of the Polish campaign without even getting off the ground. Following mobilisation on August 24, 1939, II Gruppe of KG 26 (II./KG 26) moved east from its home base at Lüneburg in northern Germany, via Werneuchen (near Berlin), to the small airfield at Gabbert, near the Polish border, where the unit waited for Germany’s declaration of war. As bombs were loaded into most of the 32 Heinkel He 111s that formed the Gabbert detachment, the unit’s armourers discovered that many of the bombs were getting stuck in the bomb adapter; the bomb’s attachment screws were too long and poked out of the casing. The solution was simple: the screws were filed down flush with the casing. When this had been done, the unit was once again ready for action. On September 1, 1939 — the opening day of the Second World War — II./KG 26 flew its first missions to Posen and other Polish towns to bomb railway stations and other targets. The unit suffered no losses — a situation that was to change dramatically three days later. So what had happened? The armourer working on 1H+LN had dropped one of the armed 12kg (25lb) SC 10s. The resulting explosion detonated the other bombs already loaded aboard the bomber. Further explosions followed as nearby bombs on the ground detonated owing to the pressure wave. Then things went from bad to worse. The Heinkel had 2,000lit (440gal) of highly infl ammable fuel in its tanks, which ignited simultaneously. Ground personnel and aircrews ran to their machines — also loaded with bombs and fuel — to pull them away from the ensuing inferno. Surveying the damage Six men were killed instantly and another 15 were seriously injured, one of which subsequently died some days later. The Heinkel, 1H+LN, was totally destroyed and the unit’s remaining bombers were heavily damaged; 5./KG 26 was out of action for days as a result of losing the majority of its aircraft. 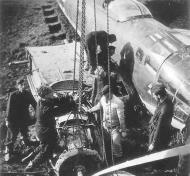 The damage did not end there — a Junkers Ju 52/3m and Focke-Wulf Fw 58 were also seriously damaged. The unit proceeded with a comprehensive clean-up, which took two full days. An investigation into the incident revealed that another mechanic working in the cockpit of 1H+LN had switched the bomb-selector panel in the cockpit to “live” — not for bomb-loading. The crews were driven to the Heinkel factory at Oranienburg, near Berlin, to take delivery of brand new He 111s, and by September 10 the unit was ready for action again. The incident was, at that point, the most devastating in KG 26’s history, and was never forgotten by the Staffel members who witnessed it. Heinkel He 111 H-1 Geschwader Stab KG26 (1H+JA) WNr 5449 shot down by Spitfires and crash-landed Lammermuir Hills near Edinburgh, Scotland 28th October 1939 . Heinkel He 111H from Geschwader Stab KG26 coded (1H+JA) WNr 5449 was the first Luftwaffe bomber shot down by Spitfires over the British Isles and crash-landed Lammermuir Hills near Edinburgh, Scotland 28th October 1939 . Note the unusual markings with two sets of Balkenkreuz and the code painted under the wings. Bardufoss Airport is a primary airport situated at Bardufoss in Målselv, Norway. The airport, which is the civilian sector of the Royal Norwegian Air Force's Bardufoss Air Station, is operated by the state-owned Avinor. La Goulette is the port of Tunis, the capital of Tunisia. The Kasbah fortress was built in 1535 by Charles I of Spain but was captured by the Ottoman Turks in 1574. Heinkel He 111 H-6 2./K26 'Lowen-Geschwader' coded 1H+FK Ottana, Sardinia August 1943. Heinkel He 111H6 2./K26 'Lowen-Geschwader' coded 1H+FK, Ottana, Sardinia August 1943 Sardinia is the second largest island in the Mediterranean Sea and an autonomous region of Italy. The nearest land masses are the island of Corsica, the Italian Peninsula, Sicily, Tunisia and the Balearic Islands. Heinkel He 111H 2./KG26 (1H+KK) shot down England 1940. Heinkel He 111 H-4 3./KG26 (1H+ML) transit Malmi, Helsinki 1942. The following photographs taken shortly after the plane was shot down show the aircraft lieing in snow at Whitby on Feb 3 1940 after being shot down by aircraft from RAF 43 Squadron. Heinkel He 111 H-3 4./KG26 coded 1H+JM Norway 1941. Heinkel He 111 H-4 8./KG26 coded (1T+HK) which was the code from a former unit KG28. This photograph was taken when it was based in Sestschinskaja Russia 1942. In the photograph you can see the flack damage received from a previous mission. He 111 SEA SQUIGGLES Insignia'd & Unmarked. This is meant to be a generic maritime skin for the Heinkel 111. I had envisaged it for the Murmansk map but I think it's probably OK to use it anywhere it's wet. I think the unit is II/KG 26, which I think was actually up in Norway for a while attacking Murmansk-bound convoys, but its up to you whether you use the Marked or unmarked bmp. The He 111 skin seems to be an absolute killer to do, what with trying to make the symmetrical mapping appear not so, and especially trying to make those damned squiggles and codes look half convincing. So, I give credit to anyone who has actually come up with a workable result. I looked at lots of skins and used at least two templates, Xanty/Buglord's (I apologize if I've got you, or both of you misidentified), and the Txsquadron's one by TX-Deck. I also used various bits from a night bomber skin by, I think, UF Josse and I confess to pasting in the bombsight bit from Canon UK's StG3 Libya. While we're doing compliments I'd also like to thank my wife for enduring the foul language being emitted by her husband for the duration of this project, and for letting me postpone the building of our Shed until this damned thing was done. Just to make it extra worthwhile for you to download the skins, I've included a mission featuring them. Its called Murmansk Convoy Attack, which should give you a clue as to what you'll be doing in it. Remarks: Pictured in 'Broken Eagles 2' with notation 'who was captured after his He 111 was shot down over southern England on 11 September, 1940. Not certain this quote means for sure that he was a pilot or crewman. Remarks: MIA 1 February, 1942; failed to return from a mission west of Murmansk. Remaining crew (all MIA): Uffz Ludvig Leinweber, Observer; Gefr Hans Mayer, R/O and Ogefr Willi Wachowitz, Gunner. Source: SIG Norway. Remarks: POW 3 February, 1940 after being shot down by Hurricanes of RAF No. 43 Sq., crashing at Bannial Flatt Farm, at the Sleights crossroads, four miles north of Whitby. Remaining crew: Uffz Rudolf Leushake, Observer (KIA), Uffz Karl Missy, wireless operator (POW and Uffz Johann Meyer, mechanic (KIA). Leushake was killed on the first pass, in the nose of the AC, his Observer position. Meyer was mortally wounded in the stomach and Missy's right leg was nearly severed from MG fire which raked the fuselage. The two KIA crew members are buried in the German Military Cemetery at Cannock Chase, Staffordshire. This was the first AC to crash on British soil in WWII.